Ribin Corandum, wife of Ogust and mother of Thyst and Sapphire, was not exactly part of the most wholesome of families to start with. Things did not improve when Ribin's eldest daughter, Sapphire, became a sorceress against her parents' wishes (mentored by the statesman Paz) and transformed her parents into beasts. 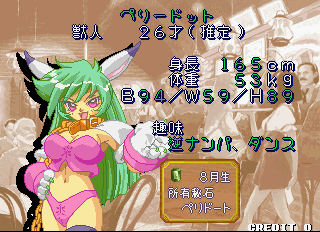 While Ogust became some dorky rabbit thing, Ribin's transformation not only turned her into a half-human half-beast, but also appeared to regress her age. Now identified as Peridot, she serves in a seedy basement bar in Forset City. While By's memory was largely unaffected by the transformation (the only notable exception being that he can't remember his name), Peridot's memory isn't quite as consistent. She doesn't recognise By all, and she only has the vaguest of vague recollection of who Thyst is, yet she's fully aware that Sapphire was her daughter. While By seems desperate to remind his family who he is (but is doomed to fail due to the language barrier), Peridot is a lot less concerned, and seems quite content just mooching around and flirting with any hot bod she can find. Peridot is a flirtacious seductress, or if you prefer to be frank, a sexual predator. She's very keen to flirt her way into the personal space of anyone she meets, and takes pleasure in dominating them in any way she can; either by just making them uncomfortable, stealing their Secret Stones or just flat-out making them into personal slaves. Rald seems to be a popular target for her affections, seemingly because he gets so flustered by her advances. However, she appears to draw the line at Thyst - the young girl is usually uncomfortable and upset in Forset City, and Peridot's motherly tendecies appear to act up, though this does little to comfort her former daughter. Wife of the wealthy merchant Ogust Corundum. She has been changed into a beast because of Sapphire's magic. For some reason the magic transformation has erased the memories of when she was human. But the words have not been forgotten. Because of the magic's influence, every night she is reminded of her lust for men, and she goes bar-prowling to find a suitable playmate. Her hobby is, of course, playing with men (call me, playboys!) - and if they last long enough, maybe even some dancing! Age 15: She received the Peridot Secret Stone as a birthday present from her parents. Age 17: Ribin moved to the capital city Pendelowke, and after meeting Ogust Corundum, the two married in Caesar City. Age 20: Sapphire is born. Age 26: Thyst is born. Age 39: After she and Ogust tried to warn Sapphire about her magic usage, the two parents were transformed into beasts. The magic was imperfected at the time, so her memory of humanity was lost, but her body was rejuvenated. Following that, Ribin moved to Forset City to begin prowling after handsome men. She began frequenting the resort area and the Peridot Mansion. After hearing rumours of the Secret Stones, she had a vision: could all men become her pets, and she their reigning queen? To make this dream come true, she began searching for the Secret Stones. Wife of Ogust Corandam. Like her husband she has been transformed into a beast but she hasn't lost her human nature and likes to go out at night. Her hobbies are dancing and seduction. She is 26. ペリドート / AUGUST / ♀, 27歳? Wife of Ogust Corandam. Like her husband, she has been transformed into a beast, but for some strange reason she seems to have become younger. Peridot ends all of her sentences with "～ん" (approx. "~n"); a negative verb ending that indicates casual and informal speech. She also ends most of her sentences with a heart symbol (♥), which usually implies being a total horn-dog. Her family name is translated differently between the Game Boy and PlayStation versions, but never accurately. If we're keeping up with the gem theme, it should be translated as "Corundum". Peridot shows you how to play the game. Peridot travels the realm and makes a collection of personal slaves. And collects some Gemstones on the side. Peridot seeks out the affection of every single man on the planet. Peridot seeks out the twelve Gemstones to become more beautiful - and by virtue, win the affection of every single man on the planet. Peridot's block pattern is very similar to Pearl & Dearl's, filling all the rows except for the second row on the left. Since her attack uses only two lines of stones, her attack power is compromised, but chaining multiple attacks can severely punish your enemy. When facing Peridot as an enemy, you can effectively chip away the garbage blocks if you can sneak the ball into the unfilled row.